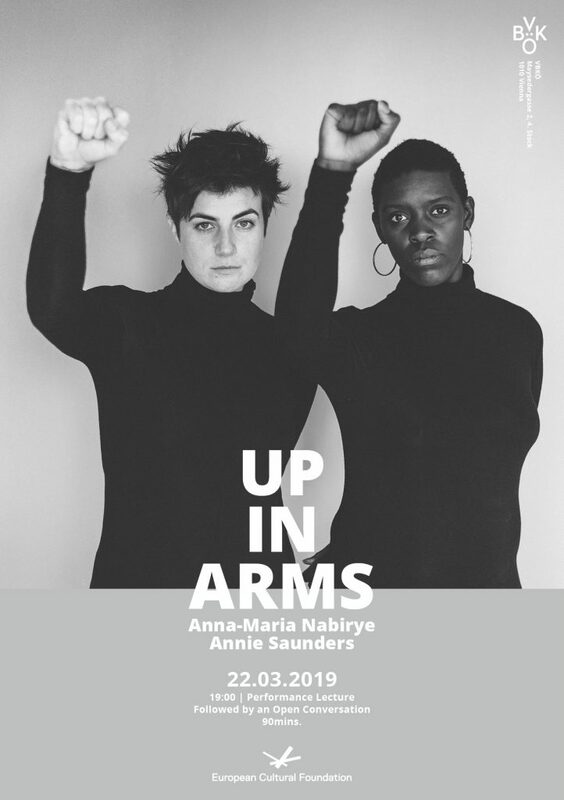 Following a residency at VBKÖ, artists Anna-Maria Nabirye and Annie Saunders present a performance lecture of their multi-disciplinary work, Up In Arms, a new way to make space for conversation in our increasingly divided world. Using ritual, photography and immersive theatre practice to create intimate conversation and radical social change, Up In Arms is a culmination of our work and relationship as interracial activists, creative collaborators, and friends. The piece exists as an intimate experience in real time, a piece of live art and social practice, as we invite a black woman and participant of her choosing, to re-enact and re-create the iconic portrait of Dorothy Pitman-Hughes and Gloria Steinem captured by photographer Dan Wynn in 1971 for Esquire Magazine. The re-creation of this image acts as a ritual to open space for uncomfortable, challenging, transformative conversation, led by the artists. The resulting audio and video recordings and portraits will form an interactive visual exhibition a live series of performance lectures and a working handbook to guide Intersectional collaboration. We’re showing up for the challenge of this conversation, and we hope you’ll join us. We’re learning a lot and are excited to share this emerging work with you. Anna-Maria Nabirye and Annie Saunders have been collaborators, friends and feminist activists working together for the last 10 years. They met working as creative activists with Eve Ensler’s V-Day, a global creative movement to end violence against women. Anna-Maria is a collaborative artist; acting work includes the BBC, DNA Films, the National Theatre and Shakespeare’s Globe. She transitioned into the Live Arts sector creating a collaborative practice, co-creating AfroRetro a fashion and participatory company focusing on fashion as a stimulus for identity and cultural exploration. AfroRetro has been commissioned by Yinka Shonibare’s Guest Projects, The Black Cultural Archives, Southbank Centre, the V&A and Brighton Museum. She has developed a 7-year collaboration with Noor Afshan Mirza and Brad Butler on artist works Hold Your Ground, Everything For Everyone Nothing For Us and most recently on The Scar. Annie is a director and collaborative live artist. Her company, Wilderness, has presented its immersive performance The Day Shall Declare It site-specifically in Los Angeles and London. They have also presented work at REDCAT, the San Francisco Playhouse and the Getty Villa and created commissioned work for Asics and Mastercard. Annie has devised and performed original work with Neil Bettles (Frantic Assembly), the Lyric Hammersmith, Bush Theatre, Latitude Festival, Charing Cross Theatre, the Cafe de Paris, Queen Mary University, Boston Court Theatre, Son of Semele and Theatricum Botanicum. She is a core collaborator with Lars Jan’s Early Morning Opera on Holoscenes, The Institute of Memory (TIMe) and Abacus.